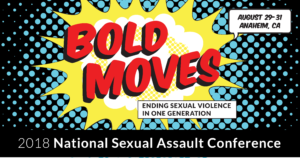 I joined the CALCASA & PreventConnect team earlier this summer, and I can’t believe we’re only a few weeks away from the National Sexual Assault Conference! Not only am I excited to be part of this team and surrounded by my wonderful colleagues, but how cool is it that I’m going to this incredible conference so soon into my journey with CALCASA & PreventConnect? My first introductions to many of our web conference and podcast guests have been reassurances that we’ll meet in person soon at NSAC, and I’m looking forward to putting names to faces and meeting so many other amazing folks in the field. This will be my very first NSAC. I’m excited to attend a few of the many intriguing prevention-focused workshops. Seeing the list of prevention-focused workshops made me wish I could be in two places (or more!) at once; it looks like there are so many impactful sessions and workshops! When I’m not dreaming of ways I can be in more than one session at a time, you can find me assisting with recording select prevention-focused sessions for our PreventConnect users. NSAC gives all of us such a great opportunity to learn and connect, and I’m so grateful I get to be part of this unique experience! If you see me, come say hi! I’m looking forward to meeting all of you and learning with you! Yay! It’ll be my first NSAC too. How exciting, Alisha! I’m looking forward to your session! !